Create a new text file somewhere, for example in the root of disk C. Name it "cron.vbs". Replace %PATH-TO-PHP% with path to php executable file (php.exe). Be sure to use "php.exe", not the "php-cgi.exe"! Replace %PATH-TO-KMP% with physical path (not URL) where you have installed KnowledgeBase Manager Pro. Replace %URL-TO-KMP% with URL to location where you have installed KnowledgeBase Manager Pro (if open this URL in your browser, you'll see the front-end part of your knowledge base). Please note that website name should not be "localhost", otherwise you would get incorrect URLs in emails that KMP sends - users won't be able to open articles they are subscribed to, etc. Please, do not forget the slash at the end of the last parameter for the php.exe. Go to the Control Panel > Scheduled Tasks. 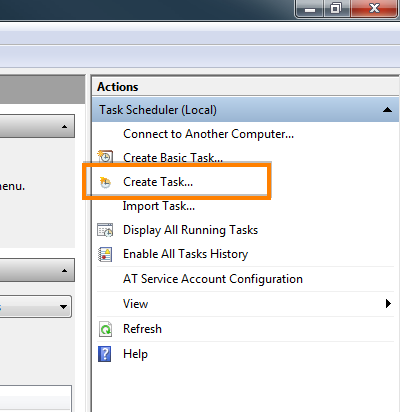 Click the "Create Task" on the right pane. Give it an appropriate name, e.g. 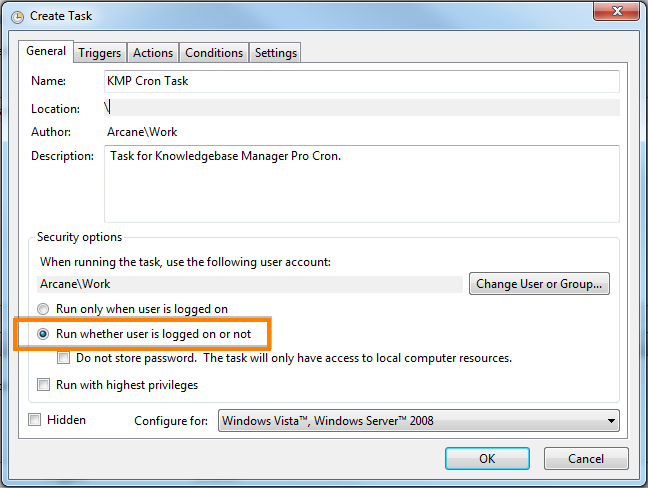 "KMP Cron Task" and set the "Run whether user is logged on or not" radio-button. You may want to change user under whom the scheduled task will run. Go to the "Triggers" tab and click "New...". 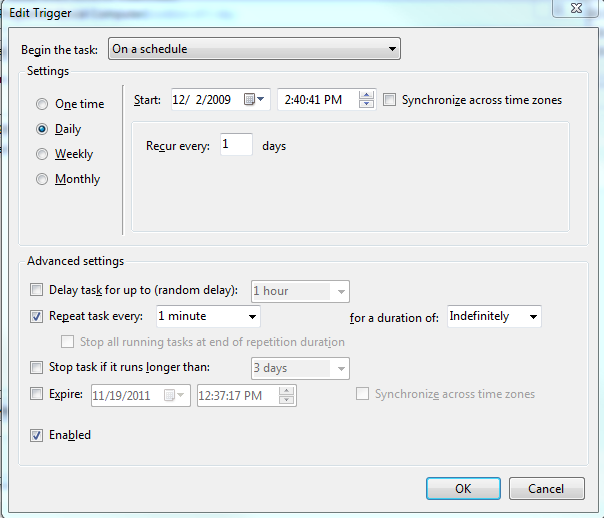 Set checkbox on "Repeat task every" and enter "1 minutes" to the next dropdown menu (there is no "1 minutes" item, but you can easily enter it from keyboard). Go to the "Actions" tab and click "New...". Click "Browse..." to select cron.vbs. 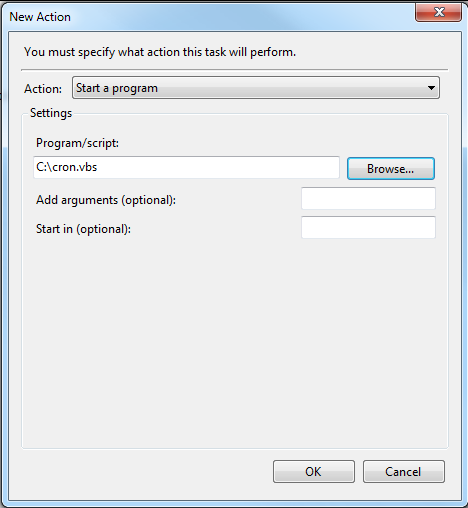 Click OK on both windows and you're done with Cron setup. Open the KMP control panel and go to Administration > General Settings > Auto Related Articles. You may see the following message there previously: "You have to setup cron script in order to use this functionality." This message will disappear after the first run of the Cron script. Click "Recheck" in about a minute to see that Cron job has been successfully installed.